and God is cognizant of all things. The Seal completes the chain of prophets. His voice, his revelation, his life is a repetition of previous prophets and messengers, from Adam to Moses, from David to Zoroaster, from Shuwaib to Ezekeil. Each of these humans ascended to the limit of speech and obtained Prophecy. So too with the Seal: his message is identical to that which preceded him. But his completion is perfectly final, not because of his individual ascension, but because how his ascension stands in relation to the rest of the world. For it is only through the Seal that we directly experience the Mirror of the Divine. Like the other prophets and messengers, the characteristic of the Seal is as a perfect Mirror, reflecting the Light of an Unknowable Beloved from above. But the Seal opens up a new paradigm of spiritual possibility: his position as a you in the Divine narrative. Up to the point of the Seal’s first revelation, the Divine narrative was in third person of the stories of the Torah, witnessed accounts of the Gospels), or the Me to a plural you of God's commandments, songs and testimonies, mediated by the many inspired regents of history. But the Qur'an is written in the second person. God addresses Prophecy as a singular "you" throughout. To read the Qur’an is to be substituted for the messenger himself, to be transported to the moment of that revelation. The scholars of Islam are correct when they say that each messenger delivers the same message, but one tailored for their particular context of revelation. Abraham’s message was of submission. Moses brings the commandments. Jacob manifests the sanctuary. Ezekiel provides a science of realignment for the house. 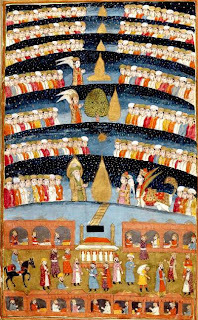 Their ummahs (community) followed, as best as they could. So too with the Seal. The Seal serves a similar purpose, to raise the ranks of ordinary men, turn them away from sin and guide them back to the garden. A physical ummah followed and follows. But the Seal does something else, and is unique in his station: for his station is the highest station. Not the highest just for him as a man: it is the highest because his attainment opens up immediate access for all humankind to Prophecy. The shifting signifier: an access point for all human consciousness to substitute itself as a Mirror for the radiance. Watch / Listen to the Youtube version of this post done excellently by The Tailor of Good Garment, may God bless him for his work. The message has a very distinct subtle quality in terms of vibration and language that is essential for transmission of truth. > Click here to watch / listen to The Seal of Prophecy via Youtube. "If you love me, show it by doing what I've told you. And I shall pray the Father, and he shall give to you another comforter (paracletos*), the Spirit (pneuma) of truth, to dwell with you until the ages. The world without awareness can not recognize because it does not have the eyes to see him, does not know what to look for, and you shall know him, because he remains within you, and shall be among you." * As the original word spoken by Jesus in Aramaic is lost, the already translated Greek word Paracletos closely means Comforter, Helper, Friend. Many Scholars believe that because of exclusivism (that unfortunately appears in all organized religion) earlier teachings of Church misinterpreted Paracletos simply as Holy Ghost or Holy Spirit. Its a misinterpretation because whom Christ is talking about is his natural successor in the chain of messengers that will come after him, not the Angelic Holy Spirit because Holy Spirit was already sent and made known during his lifetime, for example Holy Spirit descended even upon Jesus during his baptism at the Jordan River and later. So 'Another comforter' to be sent after him, is Christ's affirmation for the continuation of the chain of transmission, for the continuation of the Messengership.